So, we successfully managed to sit through the entire ‘My Little Pony’ movie! My son kept crying and running towards the exit on and off and when there was just fifteen more minutes of the movie left, he gave the biggest cry scared of the monster on screen. This was his first time in a theatre and he kept saying he doesn’t want the big TV and wants only his small TV at home! But he enjoyed all the songs and said those were happy. I started watching the movie with him paying full attention and asking him not to be scared and telling him princess pony will be rescued. I realized that he was just not used to seeing real villains in his Nick Jr shows and that was the reason he was scared. Though I kept debating if I should just leave, my daughter wanted to see the movie fully. She enjoyed the songs and got herself interested in the movie after a while. When the movie finally ended and we came out of the theatre, my son said pony was happy and he wanted to watch it again! Fascinating how a child’s mind is! This entry was posted in Life's Like That, Movies on November 20, 2017 by admin. Fifteen minutes into the movie, I wonder how I am going to pass the next 75 minutes. While my 5-year old seems to be enjoying it, a few minutes of seeing black monstrous ponies on screen later, my 2-year old wants to go back home and watch Nick Jr instead! My sister and I bought a ‘My Little Pony’ puzzle when we were young kids without knowing that those were the characters of a cartoon series. Back then, I thought the ponies looked very nice. But a few years earlier, after my daughter was born, I tried watching on YouTube what I thought were my favourite ponies, but we couldn’t watch it beyond a couple of minutes. The ponies didn’t look beautiful anymore to me. We are again trying to watch the ponies on screen only today since that’s the only animation movie in cinemas now. Apart from us, there are only 5 more people in the theatre at Cathay Cineplex, AMK Hub. My 5-year old is also not liking it now. To say that we are all bored is an understatement. Boring voices, serious conversations and fights, lots of fight – no fun whatsoever. I really wouldn’t recommend watching this movie. Let us hope that the movie becomes interesting after a while at least for my children. This entry was posted in Movies on November 20, 2017 by admin. I didn’t really like the movie and found it quite dragging. But, yes, it is important to portray what a majority of women in our country are going through post marriage through films like this. Some parts of it were quite unbelievable. From when did men have a change of heart as easily as Livingston or Banupriya’s son has in this movie and start cherishing the women in their lives right away?? Are just a break from their women and a few life lessons enough for them? The plight of the married women shown was not far from reality though. The wife being made to act as a substitute for a maid as shown by Banupriya or the wife not having the freedom to choose her career as shown by Saranya are reality which we see everyday. It did feel nice to see long lost friends having a happy reunion. The one thing which I liked in the movie is the initial documentary which Jyotika takes on housewives/homemakers where each of them talk about their lives. The contrasting personalities of one woman who speaks at length about her never-ending everyday household chores and states how much work she does and the other woman who happily says that post marriage, she is just at home doing nothing, reflected how perceptions differ, be it from the general society or from just oneself. Ironically, both women were homemakers who had children and their routines would have been similar. Yet the way the women perceived themselves differed. Did it depend on the way they were treated at home and how others perceived them too? This entry was posted in Life's Like That, Movies on October 24, 2017 by admin. Breathtaking visuals, beautiful colours, mesmerizing music, people with flaws and feelings abound, a leading lady in lovely costumes, a love story on a setting that makes you think beyond your normal lives and thank those brave soldiers who are helping us lead a safe life – that is Kaatru Veliyidai for you. If you are looking for a story of two perfect and caring people falling in love with each other and leading a happy life together, then this movie is not for you. This entry was posted in A.R.Rahman, Mani Ratnam, Reminiscing Mani Ratnam's movies on April 8, 2017 by admin. Watching Alaipayuthey fully last Saturday, I seriously couldn’t recollect the last time I watched it fully! It definitely has been a few years! Watching it make me feel 17 years younger, got me away from feeling like an oldie having entered into my 30s. 😉 And yes, it made my hands itch to write something about it here! I love colours – deep, rich colours, vibrant hues, bold strokes of colours on a canvas and even dull, moody tones. Alaipayuthey is one movie which literally celebrates colours through the song ‘Pacchai Nirame‘ and through almost every single frame. It is not just Pacchai Nirame, each and every scene of which glorifies the many varied hues of colours painted naturally by nature on this wide canvas called earth and sky. This entry was posted in A.R.Rahman, Alaipayuthey, Mani Ratnam, Reminiscing Mani Ratnam's movies on March 30, 2017 by admin. despite the years that have passed by, the song still sounds as fresh as it did the very first time I listened to it! the happiness oozing out of it still continues to rub off on me and makes me feel so very happy! its music is as vibrant and cheerful as the colours portrayed in its picturization and lyrics! every time I am in awe of the rich colours of nature, it is this beautiful song that will come to my mind first! this is a song to turn to for celebrating those simple, boundless joyful moments of life, for, after all, wasn’t this song created to portray that simple happiness evoked by getting a smile from the lady the man is attracted to? this is THE song which makes me forget everything else and brings back nostalgic memories after memories which are ALL happy ones! it will always remain THE most special song! This entry was posted in A.R.Rahman, Alaipayuthey, Mani Ratnam on October 3, 2013 by admin. Sorgame enraalum adhu nammoora pola varuma? In Madras now. Madras. Family. December Season. 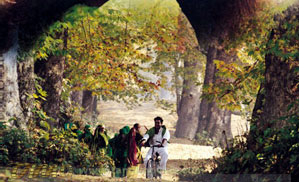 A.R.Rahman’s Elay Keechan from Mani Ratnam’s Kadal. Life rocks! This entry was posted in A.R.Rahman, Life's Like That, Madras, Mani Ratnam on December 10, 2012 by admin.